Item # 306315 Stash Points: 5,199 (?) This is the number of points you get in The Zumiez Stash for purchasing this item. Stash points are redeemable for exclusive rewards only available to Zumiez Stash members. To redeem your points check out the rewards catalog on thestash.zumiez.com. The original Kangol Bermuda Casual hat is back and taking the streets. Bred in the UK and raised in NYC, Kangol rose to fame in the '90s with their iconic designs. Throwback your style with this black design that will complete your look with some hip-hop-inspired finesse. 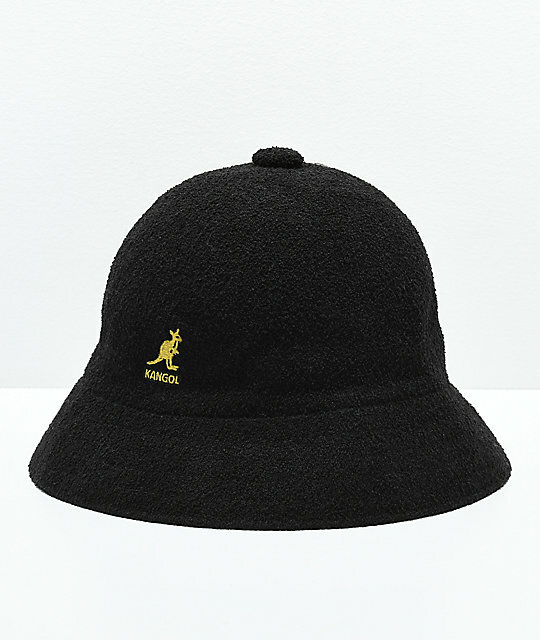 Bermuda Casual Black & Gold Bucket Hat from Kangol. 2" (5cm) brim wraps all the way round. Kangol logo graphic embroidered on the front. 45% modal, 35% acrylic, 20% nylon.